Curtiss Baby Ruth Candy 1926 Ad. This color December, 1926 ad states the Christmas favorite. If you want to make your own Christmas a merrier one, buy a whole box of 24 delicious bars of Baby Ruth. 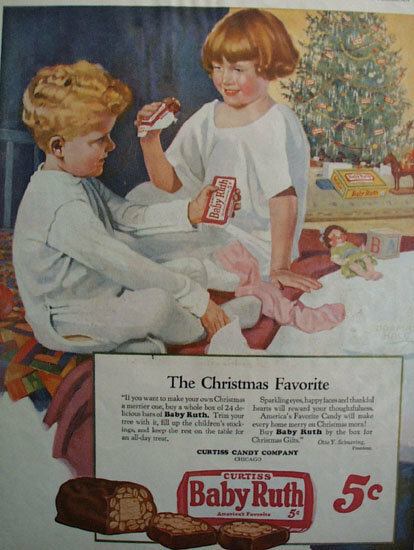 Picture shows boy and girl setting in pajamas eating baby Ruth Candy Bars, in Background is Christmas Tree and Box of Baby Ruth Candy. Magazine tear sheet picture is taken through plastic and may show wrinkles or crookedness that is not in the ad. This Original magazine tear sheet measures 10 1/4 inches wide by 13 1/4 inches tall. Items Similar To "Curtiss Baby Ruth Candy 1926 Ad"